Apple, Samsung, Motorola, Google and Microsoft recently released new devices, which means many B2B professionals may soon be looking to upgrade their devices. With new phones and major operating system updates, it’s time to think about what you can do to improve your smartphone experience. Smartphones have become the primary computing device for millions of people. A Pew research study found that nearly two-thirds of Americans and nearly half of Canadians now own a smartphone. Around 19 percent of Americans actually use a smartphone as their primary means of accessing the internet, as Pew reports. In 2010, only 20 percent of the US population used a smartphone. Whether you are looking to wipe your phone to sell it, clean your existing phone for the new operating system, or enhance your phone with some new accessories, these seven tips may help you continue to get work done on the go. If you’re looking to sell your old phone, or pass it along to a friend, you’ll want to ensure your data is off the device. There is no universal method for completing wiping (returning it back to factory out-of-the box condition) your phone, but you will find the option for doing so in the Settings area. Given the integrated theft-deterrent feature of iOS, it is important to first toggle off the Find My iPhone feature before performing a full wipe. There are only a few smartphones today that include a microSD expansion card used to store you photos, videos, and large files. Most modern smartphones have integrated storage and given that smartphones are used as the primary camera for many people that storage may be getting full. There are a number of free photo backup and storage options (Google Photos, iCloud, Flickr, OneDrive) so there is no excuse not to have your photos set to backup via a WiFi connection. You can also connect your smartphone to your computer and physically backup your photos via a USB cable. After backing up your photos, you can then choose to remove them from your device storage and free up valuable space. Make sure you do not remove the photos from the device and online storage. There are thousands of applications available for all smartphones and many of us are guilty of installing the latest and greatest app or game. However, data shows that most people spend the majority of their time on just five third-party applications. How often do you play Angry Birds anymore, really? Do you still check the New York Times app or are you often going to their mobile site? You can go into the applications or storage setting on your smartphone and sort your installed apps by file size to see which ones are the major consumers of your integrated storage. High-end games tend to take up serious storage, often on the order of 1GB to 3GB. Uninstall those apps and games you rarely use. You can always install them later if you change your mind. People spend hours browsing the internet on their smartphone browser and may not think much about how much data is being collected and stored to speed up the mobile browsing experience. Clearing your browser cache may not recover a vast amount of data, but at times every little bit helps. On your iPhone, go to Settings>Safari and then tap on Clear History and Website Data. We use our smartphones everywhere we go and that leads to a build-up of bacteria. Holding your phone up to your face and tapping on the display all day also leads to grease and fingerprint accumulation. 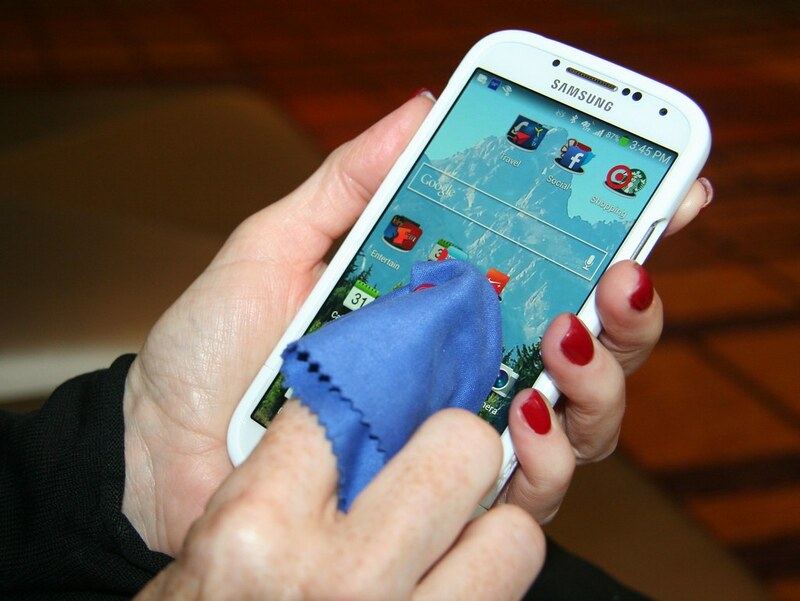 It’s a good idea to have a microfiber cloth nearby to keep your screen clean. To clear the bacteria build up, you can use something like the ZAGGfoam or ZAGGwipes. Just be sure to avoid using a lot of water or rubbing alcohol to clean the screens, and avoid using tissue paper that can potentially scratch your phone’s surface. The glass used on modern smartphones is resistant to scratches, but they can break or get scratched with rough handling. There are both plastic and tempered glass protectors today with the tempered glass options offering a touch experience similar to the native display. Millions of Apple iPhone owners, including me, place their iPhone in a protective case. With all of the new phone releases, cases for your existing phone may have dropped in price so now would be a good time to pick one up. New cases also appear with new phones so look for one that offers the style and protection you need for working on the go. Most modern smartphone have integrated batteries so you can’t just switch out a battery while working on the road. Did you know that most smartphones today also support fast charging technology? This functionality lets you connect a fast charging device and recover a significant amount of battery in just minutes. Quick Charge 2.0 is Qualcomm’s fast charging standard (https://www.qualcomm.com/products/snapdragon/quick-charge). Other chip makers, including Samsung, have also integrated the technology into mobile processors. You must have a device that supports the rapid charging standard in order to see the benefit of plugging in a rapid charger. The technology works by drawing more amperage, up to 3 amps, and then providing 15 watts of power to the device. If you plug in a rapid charger to your existing device that doesn’t support rapid charging it will charge your device at the normal rate without hurting your device. You can’t use current USB ports to quick charge your phone since USB does not yet support the higher required amperage needed for fast charging. Qualcomm states you can charge devices up to three-quarters faster than with a standard charger. For example, you can get up to eight hours of battery life on a Moto X in 15 minutes or you can achieve up to four hours of battery life on a new Samsung Galaxy S6 in just 10 minutes. Samsung thankfully includes an Adaptive Fast Charger in the box, but you can also find low cost Aukey wall chargers, car adapters, and portable battery packs that all support rapid charging technology. Next year you will see Quick Charge 3.0 products that are designed to charge up to four time faster than standard charging. Unfortunately, Apple doesn’t yet support fast charging technology so you will have to consider carrying a battery pack or a case with an integrated battery. Other tips we missed? Let us know in the Comments section or tweet us @b2bnewsnetwork! Matthew Miller started using mobile devices in 1997 and has been writing news, reviews, and opinion pieces ever since. He is a co-host, with ZDNet's Kevin Tofel, of the MobileTechRoundup podcast and an author of three Wiley Companion series books. Matthew started using mobile devices with a US Robotics Pilot 1000 and has owned more than 200 different devices running Palm, Linux, Symbian, Newton, BlackBerry, iOS, Android, webOS, Windows Mobile, and Windows Phone operating systems. He's a professional engineer by day and a mobile writer by night.